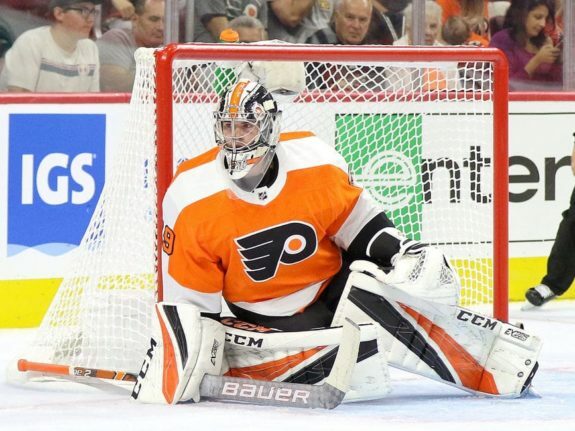 As the halfway point of the National Hockey League season approaches, the Philadelphia Flyers find themselves in a tough spot. A tumultuous stretch of play led to big changes within the organization with desperate hopes of turning things around on the ice. Now, with those changes taking root, the Flyers are taking some steps forward yet still take too many back. When Scott Gordon was named interim head coach earlier in the month, it brought a breath of fresh air to the locker room. The call-up of prized goalie prospect Carter Hart also added to the excitement of a fresh start for the team. Games against the Detroit Red Wings and a strong Nashville Predators squad yielded positive results for the Flyers as it looked like things were clicking correctly for once. Riding the high of consecutive wins for the first time in what felt like forever, the Flyers fell back to Earth after a close-but-no-cigar loss at the hands of the Columbus Blue Jackets. The Flyers were outscored 3-1 in the second period alone and then failed to complete a comeback, ending up in a 4-3 loss. Another defeat after signs of life showed just how far they had to go in order to climb back into the playoff hunt. More positives came in the following days, but again, negatives haunted Philadelphia. A solid shootout win against the New York Rangers gave off positive vibes going into the holiday break only to be struck down by the juggernaut Tampa Bay Lightning. Once again, the Flyers mounted a comeback similar to that of their earlier game against the Atlantic Division powerhouse, on Nov. 17 . Unfortunately, the same outcome repeated itself as the Lightning emerged victorious in overtime. Despite recent losses and continued struggles, there are some things that have given the Flyers life since their coaching change. As mentioned before, calling up Hart brought much-needed comfort to the team’s goaltending situation. So far, the young talent has showed that he indeed does have talent. Through four games, he owns a 2.28 goals against average accompanied by a .917 save percentage and a 2-2-0 record. Although the team in front of him still isn’t at its best, the 20-year-old has shown poise between the pipes. Defensively, the team is also seeing signs of betterment. Shayne Gostisbehere registered a goal against the Panthers on Saturday night and also effectively jumped into rushes several times in the opening period. The goal was his first point in four games and his seventh point in 10 career games against the Panthers, according to Bill Meltzer of the Flyers’ website. At this juncture, the Flyers still have lots of work to do if they’re to have a chance at making their way into the postseason. Coaching and player performance have brought positive signs to the team, yet continued struggles still weigh them down. From here on out, each and every game will prove to be just as important as the next.